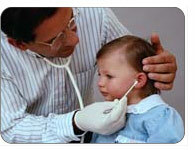 Ear infections, also known as acute otitis media, are the second most common childhood illness next to the common cold. It is estimated that the majority of children will have at least one ear infection by their third birthday. Quite simply, ear infections are caused by a build up of fluid and bacteria near the eardrum. Because children's ears are still growing, their Eustachian tube is shorter than adults. This means that bacteria is able to reach the middle eardrum very quickly. Although ear infections can happen at any age, they seem to peak when your toddler is around 15 months. The most frequent signs of ear infection is pain. If your toddler complains that her ear hurts, there's a good chance that it is an ear infection. If your toddler can't speak yet, he may seem crankier than usual and may be pulling on his ear. While this is a good indication that he may have an ear infection, teething may also be causing the pain in his ears. Other common symptoms of ear infections include fever; a decrease in appetite (your toddler may have an upset stomach or find it hurts to chew and swallow); diarrhea, troubles sleeping (ear pain can increase when a child lays down); increased fussiness or crying; and an unpleasant odor coming from the ear. Occasionally, there may also be a yellow or white fluid oozing from ear. This is pus and is a very good indication of an ear infection. While it is a good idea to contact your pediatrician if you suspect an ear infection, especially if it is the first time your toddler has ever had one; a trip to the doctor may not be necessary. Ear infections often clear up on their own within 48 to 72 hours, so long as there is no pus draining from the ear and your toddler isn't experiencing a high fever. If she doesn't appear to be in too much distress, you may want to administer some children's acetaminophen or ibuprofen to help ease the pain. However, if there is no improvement after a few days, contact your pediatrician. Antibiotics may be prescribed to help treat the ear infection although often doctors prefer to avoid them since the body can build up a resistance to antibiotics. Even if your pediatrician does prescribe antibiotics, she may suggest you wait a few days to see if the infection gets better on its own. If you do begin administering antibiotics, make sure you finish the entire prescription, even if the symptoms disappear. Discontinuing a prescription before it is finished may cause only the weakest bacteria's to be killed off while the stronger strains continue to flourish. If your toddler doesn't seem to be getting better after a few days, though, contact your pediatrician again for a reassessment of her treatment. Toddler's who have repeat infections may be recommended for a simple surgery where tiny tubes are placed in the ears that act as pressure valves. These tubes help let air in while letting fluid out thereby minimizing the potential for bacterial growth. This type of surgery is fairly common: in the United States alone approximately 1 million children have this procedure done every year. However, not all doctors agree that surgery is the way to go. If you are considering it, be sure to speak with your pediatrician first. While surgery may seem a like an extreme cure for repeat ear infections, it is often recommended because constant fluid in the ears can cause hearing troubles and even hearing loss. Additionally, when toddlers can't hear correctly, it is difficult for them to learn how to speak properly. As a result, speech development can be slowed down in toddlers who have repeat ear infections. Ear infections are more likely to occur when a child has been sick and their immune system has been weakened. Making sure your toddler's vaccines are all up-to-date can reduce his chances of developing an ear infection. Both the Hib and pneumococal vaccines as well as the annual flu vaccine have all been found to be especially effective in reducing the occurrences of ear infections. Also, second-hand smoke can weaken a person's immune system, so keep your child away from cigarette smoke as much as possible. Other things that can help prevent an ear infection include breastfeeding your baby and propping your child up when they are drinking from a bottle. Additionally, washing your hands frequently, as well as your toddler's toys, can help reduce the number of germs he will come into contact with thereby minimizing the chances of an ear infection. Ease your toddler health concerns by chatting with other moms in our toddler forum.